The FOMC is moving closer to ending an unprecedented period of near-zero interest rates without providing a clear signal on the timing of liftoff. Federal Reserve policymakers said the labor market and housing have improved, moving closer to ending an unprecedented period of near-zero interest rates without providing a clear signal on the timing of liftoff. “The labor market continued to improve, with solid job gains and declining unemployment,” the Federal Open Market Committee said in a statement Wednesday in Washington. It said that “underutilization of labor resources has diminished,” dropping the modifier “somewhat” to describe the change. Chair Janet Yellen is guiding the Fed toward its first rate increase in almost a decade as the nation approaches full employment. 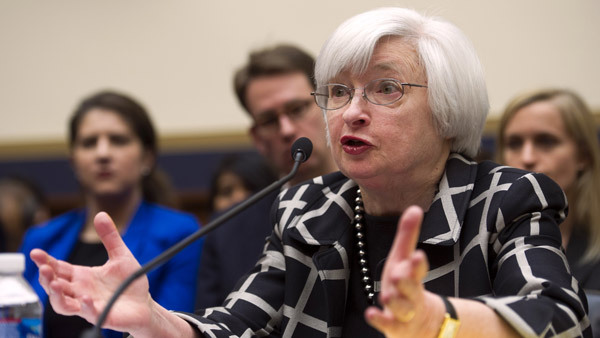 She has said the Fed is likely to tighten this year if the economy continues to improve as she expects, with market speculation focused on a move as soon as September. “The housing sector has shown additional improvement,” the Fed said. “Business fixed investment and net exports stayed soft.” It dropped language saying energy prices appeared to have stabilized. It said that it will tighten policy when it sees “some further improvement in the labor market,” adding the modifier “some,” and is “reasonably confident” inflation will move back to its 2 percent goal over the medium term. Treasury yields remained higher after the Fed announcement, with the 10-year note yielding 2.27 percent, up two basis points from Tuesday. Stocks extended earlier gains, with the Standard & Poor’s 500 Index up 0.5 percent to 2,104.59 as of 2:30 p.m. in New York. The committee has kept the benchmark overnight federal funds rate at a record low of zero to 0.25 percent since December 2008, in the midst of the worst recession since the Great Depression. Economists surveyed last week said the odds of a rate increase at this meeting were virtually zero, while the chance of move in September was around 50 percent. With policy makers saying their decisions are “data dependent,” the focus turns to figures on gross domestic product, jobs and inflation that will help determine whether the Fed raises rates in September or later. While Fed officials are heartened by job gains, with unemployment falling to a seven-year low of 5.3 percent in June, they are concerned inflation remains too low. A slowdown in China that has rocked global equity markets could also weaken the case for an interest-rate rise this year. The Shanghai Stock Exchange Composite Index dropped 32 percent from mid-June into early July. It recovered about a third of that before plunging again by more than 8 percent on Monday. Global market turmoil has helped pull down the yield on the 10-year U.S. Treasury note to 2.25 percent late Tuesday in New York from as high as 2.45 percent on July 13. The Dow Jones Industrial Average is down 1.9 percent in that period, giving up its gains for the year. More than market gyrations, policy makers are keeping an eye on China’s economy, a driver of global commodity demand. Though economists predict 7 percent growth in 2015, fears of a slowdown in China have helped push down the Bloomberg Commodity Index by almost 8 percent since Fed officials last met in June. That, in turn, could push already-low inflation down even further. The Fed’s preferred gauge of prices rose just 0.2 percent in the 12 months through May, the last month for which data are available, largely reflecting the drop in oil prices in the past year. The FOMC is next scheduled to gather on Sept. 16-17, with additional meetings this year set for October and December. Traders are pricing in a 40 percent probability that the Fed raises rates at or before the September meeting, based on the assumption that the effective fed funds rate will average 0.375 percent after liftoff. The median estimate of the 22 primary dealers surveyed by the New York Fed is that the fed funds rate will average slightly less, or 0.35 percent, after the first increase. –With assistance from Jeff Kearns in Washington.